It seems to me quite likely that when the annals of our theatre in the middle years of the twentieth century come to be written, one name will lead all the rest: that of Joan Littlewood. 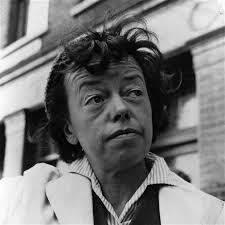 Others write plays, direct them or act in them: Miss Littlewood alone “makes theatre”. She has come back to Theatre Workshop, after two years’ lamented absence, with a triumph unimaginable anywhere but on a stage; it belongs uniquely to its birthplace – the bare boards that are Littlewood’s home ground, filled with the passion of Littlewood’s home team. 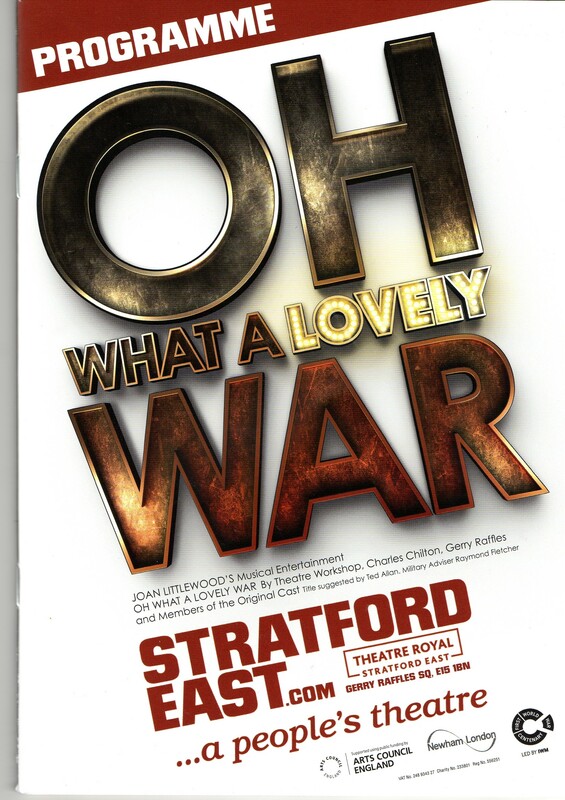 According to the programme, Oh What a Lovely War (Theatre Royal, Stratford East) was “written by Charles Chilton and the Members of the Cast”; it is further described as a “group production under the direction of Joan Littlewood”; but I must risk the lady’s fury by insisting that it is essentially a one-woman show. The big, tough, purposeful heart that beats throughout the evening belongs only to Joan. You feel that her actors have a common attitude towards more than acting, a shared vision that extends to life in general; it is thus, rather than by any rehearsal method or technique of staging, that true theatrical style is born. The plot is history: nothing less than the First World War. The cast is decked out in the ruffs and white satin suits of a seaside pierrot show. 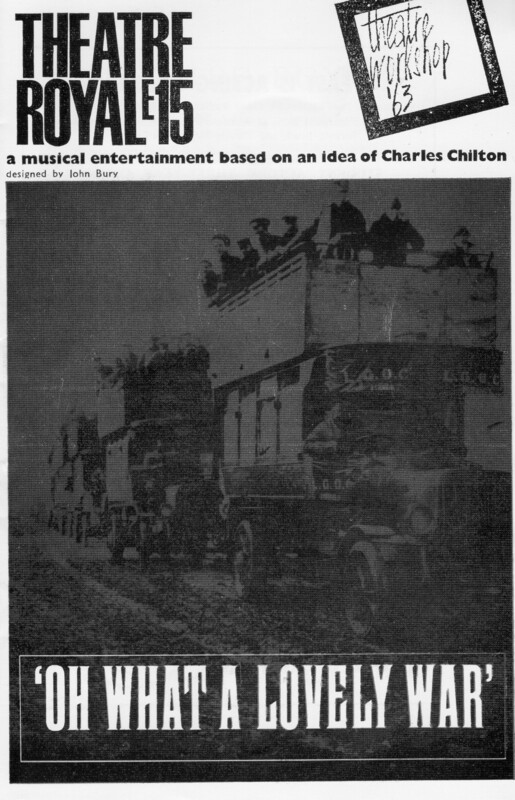 We are to witness (the compere brightly confides) that famous extravaganza, “the War Game”, enacted by the entire company with musical interludes drawn from songs of the period. The proscenium sparkles with fairy lights; and a terrible counterpoint is soon set up between the romanticism of the lyrics, all gaiety and patriotic gusto, and the facts of carnage in France. Illustrated by stills of the trenches and news reports flickering across an electrified ribbon screen. Between songs. and with minor costume adjustments – the addition of a tunic, a helmet, a Sam Browne belt – the cast perform a montage of brisk, laconic sketches, rooted in improvisation but stripped of all irrelevant detail. We glimpse a bayonet practice, conducted in lightning gibberish; a military ball, rippling with intrigue; a shooting party of international tycoons, blazing away at wildfowl while debating the relative merits of various neutral trade routes for exporting arms to the enemy; and the Christmas truce on the Western Front, which Miss Littlewood handles with utter disdain for sentimentality – the Tommies recoil with nausea from a gift of German cheese, and respond by lobbing an inedible Christmas pudding into the opposite trenches. Meanwhile, the songs grow more bitter; the lunatic Haig has taken command, and the dead are rotting in mountains, monuments to his unswerving conceit. And still, indestructibly if not always suddenly, everyone bursts out singing. In the second half, the show tends to repeat itself, as the war so tragically did: but by then Miss Littlewood’s passion has invaded one’s bloodstream, and after the final scene, in which a line of reluctant heroes advances on the audience, bleating like sheep in a slaughterhouse, one is ready to storm Buckingham Palace and burn down Knightsbridge barracks. The production brings off a double coup: it is revolutionary alike in content and form. And even those who mistrust revolution can hardly deny that it has the most memorable score in London. The cast (an ensemble from which I invidiously select the names of Ann Beach, Murray Melvin, Victor Spinetti and Brian Murphy) behaves with the same relaxed audacity that Miss Littlewood captured on film in Sparrows Can’t Sing. I hope success will not doom her present troupe to the fate that immobilised its predecessors: indefinite incarceration in the dreaded West End. This entry was posted in Fringe theatre, London theatre tours, Theatre, Theatre tours and tagged Joan Littlewood, Oh What a Lovely War, Terry Johnson, Theatre Royal Stratford East. Bookmark the permalink.